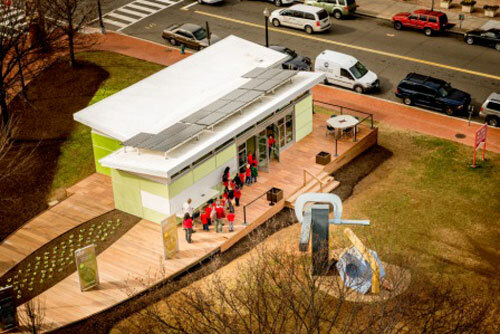 Global architecture firm Perkins+Will recently partnered with DeKalb County Schools to win an international award in the 2009 Open Architecture Challenge: Best Relocatable Classroom design. Architecture for Humanity hosted the 2009 Open Architecture Challenge . This global initiative invited the architecture, design and engineering community to collaborate directly. Along with students and teachers, they had to rethink the classroom of the future. Specifically, classroom designers entering the competition had to collaborate with real students in their community to develop real solutions. International Award in the Modular Design Category. Established in 1935, Perkins+Will is an integrated design firm serving clients from 23 offices around the world. The firm’s practices include architecture, interiors, branded environments, planning, strategies, and urban design. Perkins+Will’s clients are in the aviation, transit, corporate, commercial, civic, healthcare, higher education, K-12 education, and STEM markets. Additionally, Perkins+Will routinely ranks among the world’s top design firms. They have received hundreds of awards, including the prestigious American Institute of Architects’ “Firm of the Year Award.” With more LEED® Accredited Professionals than any firm in North America, Perkins+Will is the preeminent sustainable design firm in the country. In fact, Building Design + Construction Magazine recently rated them as the #1 Green Design firm in the country. Perkins+Will was also the first multi-office company to commit to the 2030 Challenge. Specifically, the firm has pledged that all projects will be designed for carbon neutrality by the year 2030.